It's been awhile since we have journeyed past the brink of brickly sanity. Together we have survived a PLAYMOBNAROK and a SELECTASTROPHE but is time, true believers, to take the path back to where it all began... into the Danish teeth of, if you can believe, the FIFTH coming of that which was foretold, that which is inevitable, that which will unfold - LEGOMAGEDDON!!! 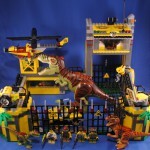 I have a mad love of the 2012 Dino line and certainly the center piece of that collection is this HQ. 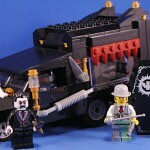 I think this is one of the greatest Lego sets ever designed as it not only looks great but tells multiple stories. To me, I see it as the entry compound to a larger "park" or "pen." I really dig the two turrets up front, and the back section is killer. On one side is a helipad for a pretty cool little copter. It's connected to a little storage facility for excess dino-tranquilizer and then there is my absolute favorite piece of the build - a tall gate with an awesome command center at the top. The only real downside is that the gate tower is a little too short to comfortably fit the T-Rex through but it's still good enough. We get 4 minifigs and 3 dinos, too! The smallest dino is a rubbery little mini-Raptor-ish sort of thing that just bums me out. It's just too similar to the Raptor and one too many "villain dinos." I would have absolutely preferred it be some kind of herbivore. The Raptor is just damn gorgeous and perfect in every way. And then then's the utter perfection that is the T-Rex. This sculpt is... so excellent! 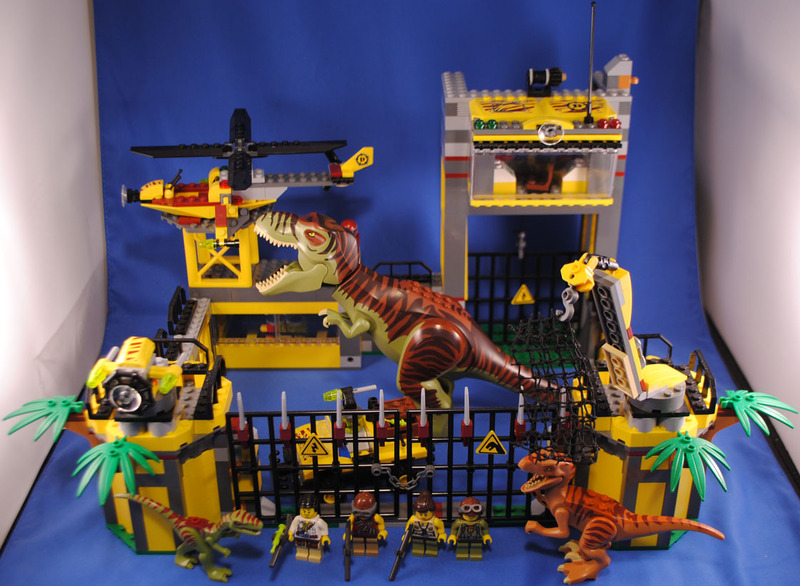 In fact all of the dinos in this line are an aesthetic brilliance that matches the look of Lego so well. Detailed enough to be interesting but stylized enough to not feel out of place. I LOVE them so much!!! 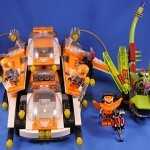 In fact, I ended up getting two of these sets and definitely plan to do a big Dino M.O.C. at some point! The Galaxy Squad theme really grew on me and I absolutely adore the good guys in this line - the white + bright color aesthetic is awesome. The bug ship is neat, it's a fun design and has some nice parts but I've never really dug their look (and indeed the Mosquito-head minifig is goofy as heck) but at least the purple containment thing is super cool. 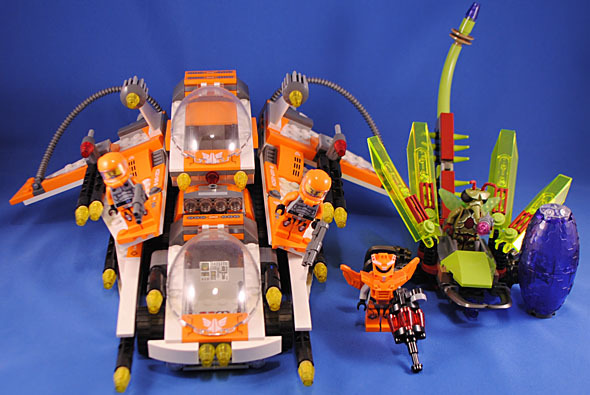 The orange guys' vehicle is super, super cool - not only does it look great as is, the front pod pops out as it's own rover allowing the top pod to fold down and the second set of wings to swing out turning the thing into an attack cruiser. Awe. Some. Awesome. I love it! The only thing missing from Galaxy Squad (aside from cool/er bad guys) is those old Space baseplates with the sculpted craters on them. This set screams for moon craters! Yeah, thanks for a super confusing set name there, Lego. Anyway, here we get a great build that acts as an add-on to the full Hogwarts castle, or even just as a nice Hogwarts backdrop for those that can't afford/find the big set. It loosely recreates the scene from the last movie where in the/a bridge to the school blows up and while I 'get it' I'm not crazy about it. It requires the turrets to have a rock base to raise them up which doesn't quite mesh with the Hogwarts Castle, nor is there much space for anything to happen within them. Also, we only get one Deatheater, and it's Luciuous effin' Malfoy... AGAIN. It's SO ANNOYING that we basically just have an army of the ONE GUY they made identifiably different from everyone else... Ugh. We also get yet another Harry, though that's understandable, but there's an exclusive Slytherin student, Neville Longbottom (though he's in civies), a professor I presumed was Madame Trelawney given the set and her implied classroom but is actually Professor Sprout despite the lack of a greenhouse, and best of all - Remus Lupin, AND a Dementor! There's even a build of the Mirror of Erised, to boot! All around this is a nice set, but it's not an especially great one alas. 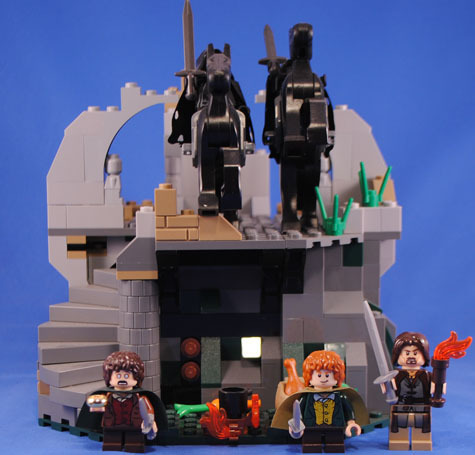 This is a really wonderful little build of Hagrid's iconic hut. I particularly appreciate the brick-built roof as opposed to the fabric ones of previous iterations. 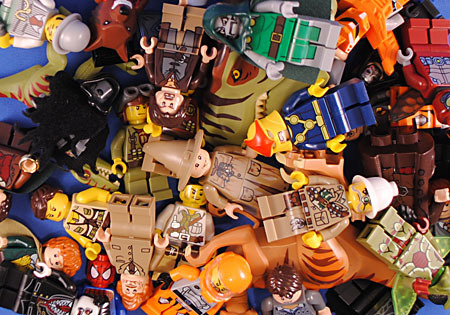 The minifigs are boring, though, as they're all available elsewhere in the line and are just the major characters. On the plus side, though, you a couple great owls, scabbers and baby Norbert! Fang would have been a very nice inclusion here, but clearly cost was an issue. We also get Aragog and some of his kids, and while his inclusion is relevant to the last film/s I think we ALL would have much more preferred a re-release or upgrade of Buckbeak. All in all, this is kind of a frustrating set. 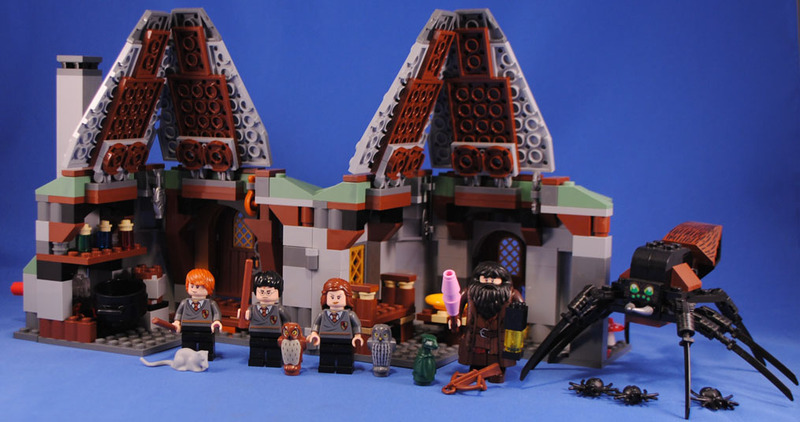 The hut is great but everything else is mediocre - the minifigs and Aragog feel like filler which is annoying because the Hut is for die-hard fans but that same group will already have these characters from other sets. Oooh well. This is a super cool set that clearly was designed by a fan of the books since the 'downstairs' is certainly the barrow which was excised from the film. 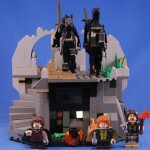 Frodo is the only carry-over minifig here as we also get, exclusively, Samwise, Strider and two Ringwraiths! I'll never, ever understand why Lego didn't do another set with a couple Ringwraiths in it at a lower price point because folks, LIKE ME, want NINE! And since we're on the subject - what the hell, Lego!? Why do we have the Council of Elrond and not the Balrog!? How do we have the pirate ship and not a Fell Beast!? Talk about self-imploding a license... Well, anyway this set is super fun. Sure the scale is cheated but it does a nice job of recreating Weathertop, complete with microfigs as little statues. 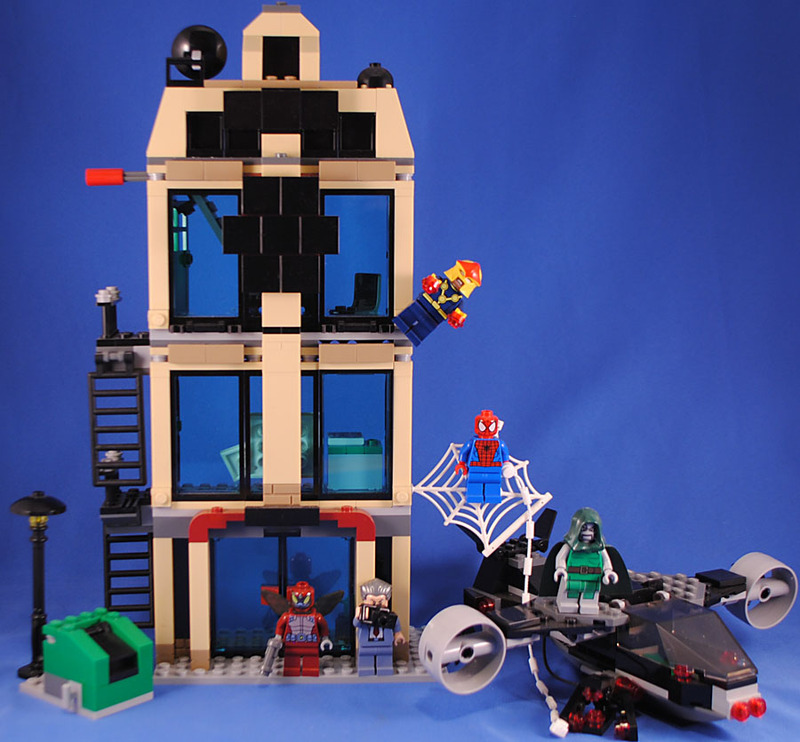 It's a complex and fun build plus it comes with a bunch of nice mini-figs, so yes - this set is absolutely worth getting! Monster Fighters was another great theme of late. I'm generally not a fan of cars but this is actually a pretty neat souped-up hearse looking thing. I particularly dig the maroon "spikes" as curtains. We get a neat Dracula and what would have been a cool Zombie Chauffeur if he wasn't so over-released. We also get the super cool looking Dandy Monster Fighter - I love this guy, even though he has a bit-too-much mecha leg. Aaaaand then there's this set. I don't know... it's just not anything that exciting. 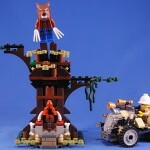 Actually, I do like the old guy's car but the tree build is just kind of... not that great. 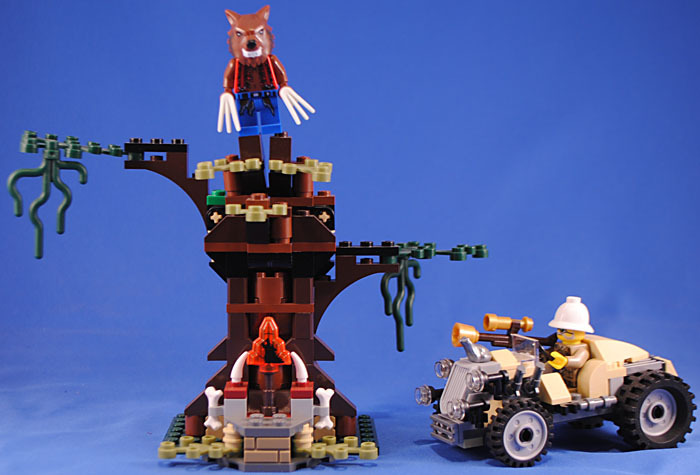 And then the wolf figure himself is kind of boring too, and I especially don't like or "get" the Wolverine claws. 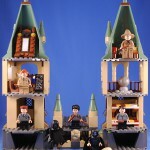 I don't know, it was on sale and it helped complete the set (though I ridiculously missed out on the Dracula Castle). I've been sitting on this sucker for awhile now, it's what I got to qualify for the free Hulk Mini-Figure at the Lego Store a couple years back. It was part of the somewhat misguided hoopla around the 3D re-release of Episode I and I'm pleased for it since this turned out pretty nicely. It definitely nails the shape and look of the ship and has a surprisingly cool cockpit, even with extra storage underneath. The front wedge opens up to contain the speeder and the two probe droids, which is neat but kind of odd looking when open. And then, of course, there's the mini-figs. Qui Gonn is the only one available elsewhere with Captain Panaka, Padme and Darth Maul all being exclusive. The later is particularly annoying since he turned out so well AND has alternate cowl and horn-crown-piece - I want at least two! To be accurate to the set he should have the hood up, but man... if you only have one Maul it's got to be horns out! It's odd they haven't found a way to get him out again. Guys... I really kind of hate this set. I think it's shockingly boring and every way. HOWEVER... it does come with Dr. Doom, for whom I have a longstanding and deep-seated affection, and between him and a sale at Target I was relatively forced to buy in. The Daily Bugle building is "cute" and I appreciate the details on each level but it's a lifeless design in boring colors. There is a confusing and pointless streetlight and garbage bin, certainly a better use for budget than adding some architectural flourishes to the building, like gargoyles and what not... The only interesting part of the build is Dr. Doom's jet, but even that is less impressive in hand than in photos. So, the only reason to get this is the mini-figures. JJJ is neat but Spider-man is his old fine but boring self. Then there's Firefly or whatever that character is called in the Marvel-verse, which is a completely left field choice but makes some sense due to his wings coming from Galaxy Squad and that he is a Spider-man villain. Then we have the pointlessly random mini-figures which are likely the only selling points to this set. Nova is a cool little figure, though somewhat of an odd choice since he's in the classic costume, but his helmet turned out neat. Dr. Doom is pretty cool and though it makes NO SENSE that he came out NOT in a Fantastic 4 set I'm pleased to have him. The mask is a little underwhelming, though, so there is some room for improvement down the road. All in all, this is easily the weakest release in the entire Superheroes theme and pretty much a flat embarrassment when compared to the design and engineering of everything else in this column. 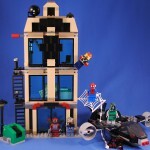 This entry was posted in Lego, Rustin's Spoils of the Week and tagged Harry Potter, LotR, Spider-Man, Star Wars, vampires. Bookmark the permalink. I was fortunate -- Kmart in AU ended up with a HUGE amount of Monster Fighters stuff about a year after it had already been and gone from the other retailers, so I decided that was my cue to buy a bunch. I assumed they'd ended up with leftover stock from Europe or the US, but I've got no idea whether this is accurate or not. That's Beetle in the Bugle set. No, it doesn't make it more interesting. And Nova is sensible if you follow the Ultimate Spider-Man cartoon- he's part of the general 'main team' of recurring heroes. 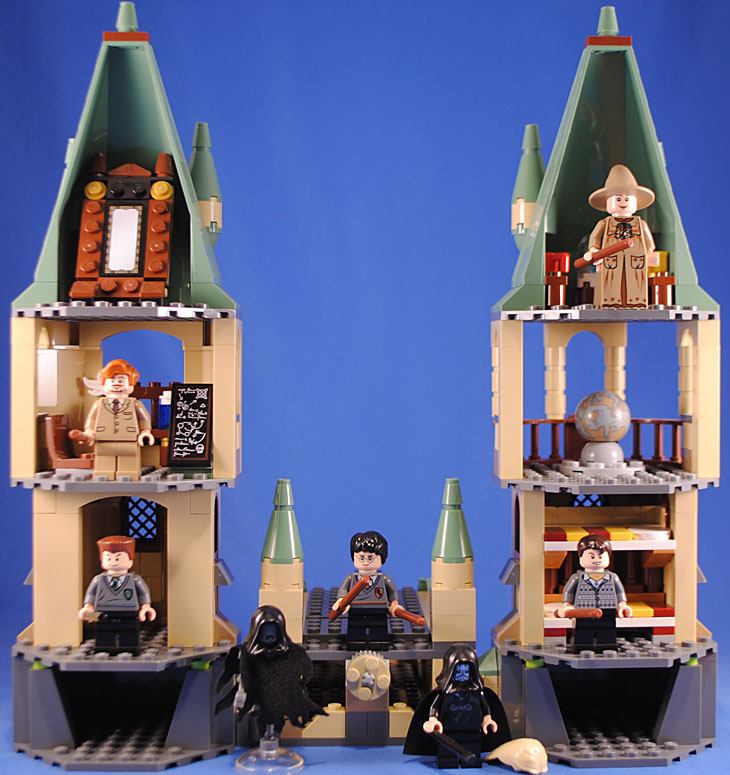 One benefit of Hagrid's Hut is that it was the easiest way to get all three of the trio in one set. And how did you not talk about the amazing light brick in that set?! I love those things! I've always been ambivalent about the light-bricks since there's generally no way to have them "always on." It's a neat feature but for my tastes it just nets out to a red technic peg permanently hanging out the back. Get two 2x2 plates, a 1x2 brick and a 1x2 plate. You can build an "always on" switch by covering the plug (but the batteries don't last that long). "there's an exclusive Slytherin student, Neville Longbottom (though he's in civies)"
Long time reader of the site, I love your spoils of the week feature. Just a word though, Neville is a Gryffindor student not Slytherin. Other than that, keep up the good work! 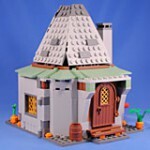 Dude, hasn't this Hagrid's Hut set been around for at least like four years? 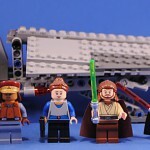 So many LEGO sets I will never own! Good thing I could read about them in Spoils!